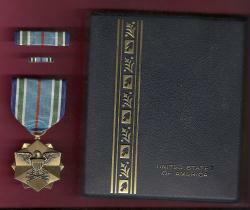 Joint Service Achievement Award Medal in case with ribbon bar and lapel pin decoration medal set. This is one is in the smaller "clamshell" case. I have these in the larger case too if preferred.